They usually end like this. I dedicate this baby to the 'Dans' here, as I think this should juice then as much as it juices MOI. Molteni orange is always good. Is that an old Merckx (as opposed to a paint job)? Definitely want the quill. The Stem is a carbon stem, so it is bulky. I intend to shop for just the right stem bar combo. Non ergo long deep drops, double groove for the Ergo cable runs etc. Stem either matching bars, or maybe a ti quill. I have the one on the Copper 753 bike, may wind up on this beast. Not positive it will be staying yet. It has a real short front center and I got big feet. It has some beasty Columbus Max sized TT/DT and stays. My 10 mile shake out ride yesterday showed a stout frame with a pretty stiff BB. Walter had a chain stay brace added and a few other things prior to sending it out for the re-fin. Walter doesn't screw around with his projects. I am sure there is a 2013 thread here Walter posted re:Molteni. "I gotta stop reading Walter's eMails to me..."
This implies you will continue to read Walter's emails to other people? 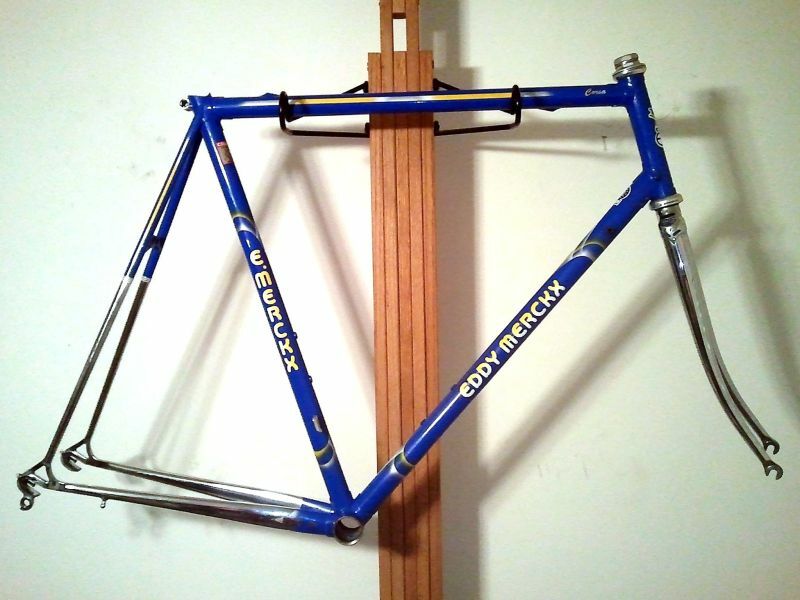 10/11/18 12:37 PM You can't go wrong with a Merckx! And what a coincidence I have to say. Just this weekend, a fellow delivered me his old bike he hasn't ridden in 25 years, you guessed it! I may sell it back to him, he indicated that he wanted to try it after I get done rebuilding it. It needs some frame straightening, so will take a little longer than usual. Like the fluted stem too. Dan, nice Molteni, er, Colnago! It's the Eddy Merckx Special, similar to a 'Nago Eddy rode in the TdF. 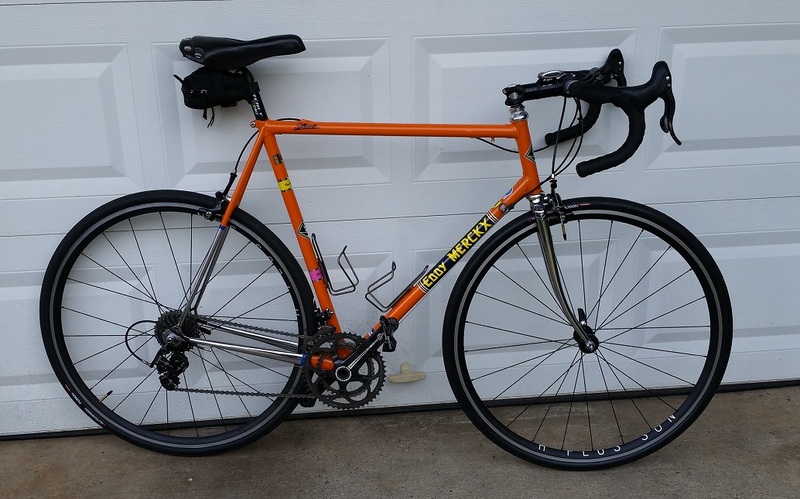 I had a Molteni orange Merckx MX Leader with Max tubing for a while. Great bike. 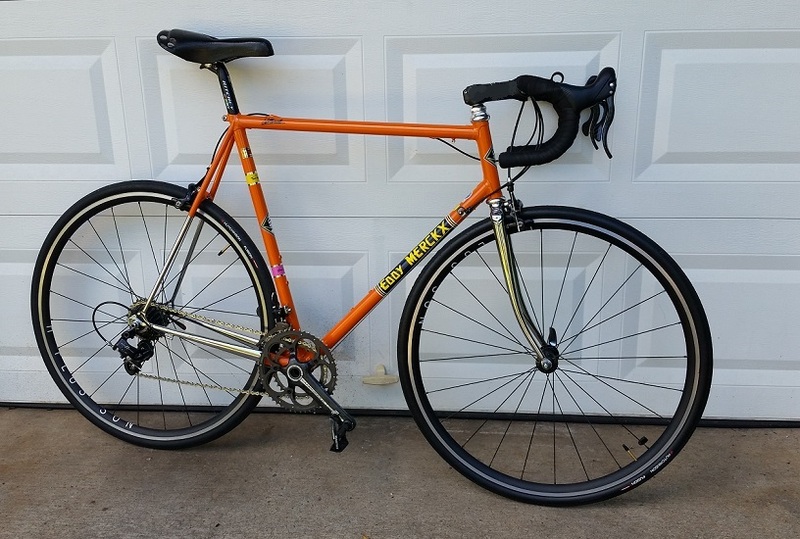 "had a Molteni orange Merckx MX Leader with Max tubing"
I rode a Max bike once, that thing was a truss. 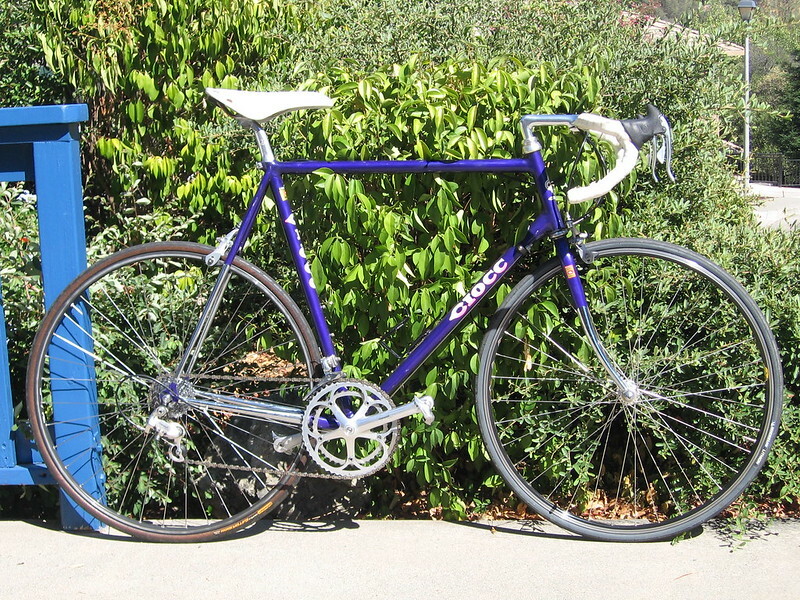 The only other bikes I recall being that stiff were the C-35 Nago and a Litespeed Ultimate. This Corsa is Thron, but has a replaced DT of Deda01. TT 28.6, DT 31.7, actually nice fat-ish tube for this fat-ish clyde. So I think beside being so damn pretty, it is sensible stiffness for the size and my girth. Same spot on the Scott a few years back a gust caused me to stop and balance for a second or two with a 30+ gust. Stretch is lined up with the turn in the river and the wind from the gorge shoot strait thu there. FWIW, I think ultimately I'd prefer the Colnago. If the Saroni Red was not higher on my list than Molteni orange I might have Molteni painted my 85 orange. 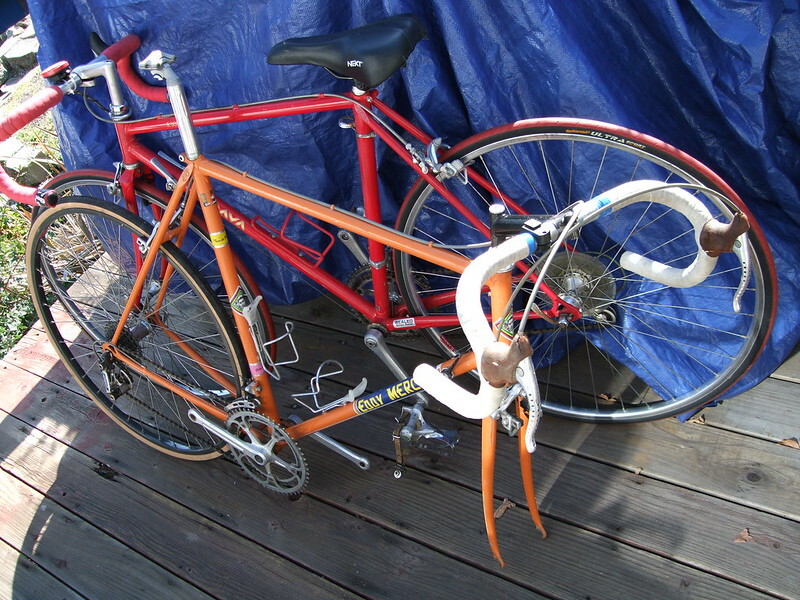 I thought about painting the Reynolds 753 some version of orange or Moteni scheme. But I don't repaint things that have good condition paint, especially if I don't hate the existing color. I am not any kind of fanboy that I appreciate Eddy's facha in the decals twice and his name Splashed on the DT. But it was a matter of time before the Orange was in my stable. You think max is stiff in your size, try it in a 51. Had a Motorola MX that had to go - it was like riding gas pipe in a 51. GP, can't even imagine that. Even my old Litespeed blade with the tall wing shaped seatpost tower and the 6/4 tube has some compliance. I suspect a lot of that is due to the huge Front Center and WB. But these 99CM WB period race bike are stout, even in the 60-61 range of the ones I have. I wonder if the Max tubeset for the smaller frames had thinner tube at least. I will consult the great seer googaal. EDIT: MAX, thinner mid butting than I expected. Actually, the 2000 road has a Teardrop Columbus DT. One version of Max that was oddly used in certain Merckx bicycles was MiniMax, which employed more-standard diameters with the thin Max walls! CIOC filet brazed headtube and unicrown fork? Did 40 miles on the Corsa today. I think me and the geometry are going to get along better than it did for Walter. That's correct, the Columbus "Foderi Laminati" fork blades are welded to the steerer, and the headtube joints are fillet. The toptube and stays are fillet-brazed to the seat-clamping lug as well, but the bb shell is spigoted. I'm not surprised that the Corsa handles well with such a long stem, which is often the case on bikes with such steep HT angles, short front-center and overall tight geometry. My TSX Century has the same HT angle, and I like the bike much better with a 110mm neck than with the former 100mm. Even with it's old 74xx 8s gruppo, It's possibly my favorite rider. 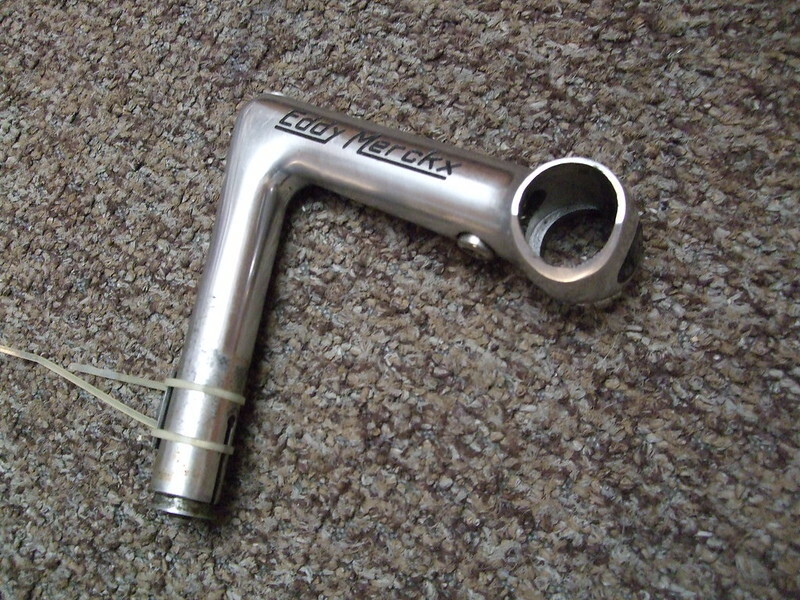 >Corsa handles well with such a long stem. That carbon stem on there is supposed to be a 11CM, It measures out to 112.3 reach with my caliper. The bars are Ergonova LTD. I find these crazy comfortable, the oval top with my huge hands are a match. Advertised reach c/c @ 77mm. I measure an effective reach of 97mm. So not sure what effect the long foil tops have actually to effect reach, other than it is longer. With 8CM setback I can see the front axle behind the bars, just. But I don't use the drop I once did either. My take: Walter had a 135 Stem, I do not recall what bars, but his reach on a road bike is 1" longer than mine. He employs 1CM more setback than I have the Corsa setup for, and I went 1CM more than usual for me to find the fore/aft CG on this short speed machine. Walter thought it steered slow, with 135 stem and who knows what reach on what 1" bars, that is a long lever. My Cinelli bars on one bike are 118mm reach for example. I remember having bars in the day on quill stems with as much as 128mm reach FWIW. He told me never liked the front end on the bike. And he had a tight headset for a while initially that made matters worse. I told Walter after 1st ride I though it steered fast. He said "really??" But I had been riding the Redline and Strong disc bike with gobs of trail for the last 10 rides. It felt perfect, the Corsa as I passed the 100 mile mark in a few days of riding. the merckx cornered great, but getting into corners was where i had an issue. initial turn-in was met with resistance, it took a deliberate move of the bars to initiate. once on your intended trajectory it was all-good. i also found it hard to ride no-handed, any subtle balance adjustments required big hip movements to correct. all speaks to directional "stiction" courtesy of an over-tightened headset. "i also found it hard to ride no-handed"
I find it the most co-operative bike to ride no hands I have ever ridden. So stiction in the headset sounds exactly like what was going on. I grabbed a 3T Stem to go along with the 3T Ergonova LTD bars, it looks a lot less bulky that the Carbon stem I started out with. I am going to leave it like this for now. I was quill shopping, and looking for some 2 groove bars. But abandoned that effort. I like these bars too much to remove them. Deeper round drops, aero flat tops, and little to no hand fatigue in use. The seat angle may look odd/askew, but this old T-Gear Pinnacle saddle actually works best like this. This my original late 90s double century saddle, for good reason. I know the quill police among us want to see a nice period quill on it. But Neo/Modern Retro with 11s Campy is more to my liking in function than older tech gear and non modern cockpit appointment.